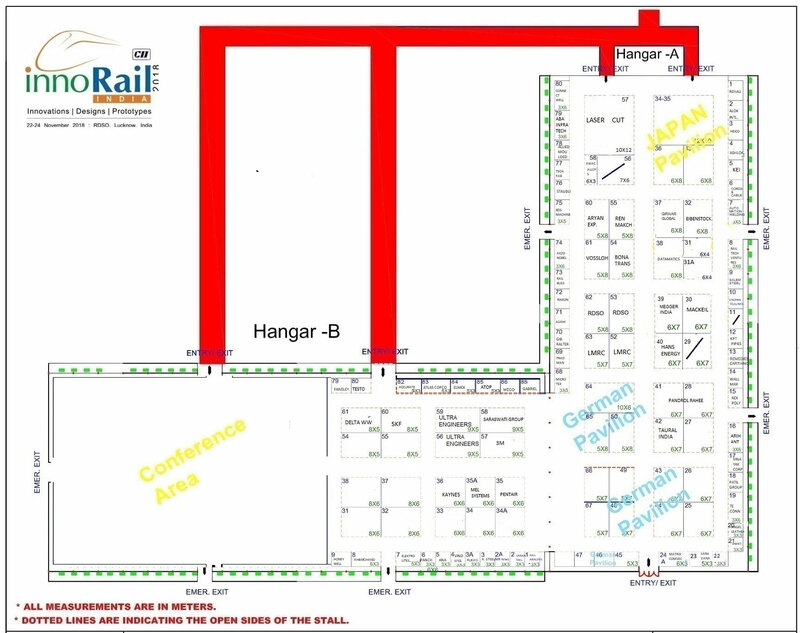 InnoRail 2018 in its third edition, is an initiative of CII in association with Research Designs & Standards Organisation (RDSO) to provide an opportunity for all stakeholders of the railways sector to come under one roof for effective business networking with key collaborators from across the globe. The first edition took place in December,2014 and the second one in December 2016. All stands size 4mx3m, unless specified otherwise. Stands numbers shown are for reference only. Stand no. given on this plan should not be used for publicity purpose. This drawing is the property of CII & all rights reserved. Organisers reserves the right to change numbering / alter the layout at any given time. Emer. Exits shown in the layout to be kept free for movement. Load bearing capacity of platform is 400 kg/sqm distributed load. Excellent Exhibition!! Thank You for organizing this. An outstanding effort and the exhibits are extremely informative. It has provided excellent opportunity to interact with best in the world. It will help in modernization of Indian Railways. All RDSO officials are going to be greatly benefited. Congrats to CII office bearers for this stupendous effort.